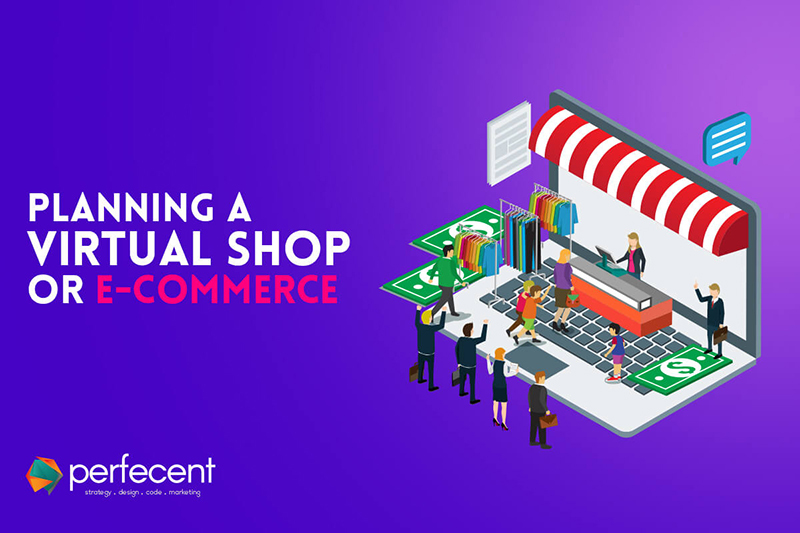 Most people who decide to open a virtual store mistakenly believe that the biggest cost is the purchase or rental of an e-commerce platform that will support the operations. The reality is that, in most cases, so that the entrepreneur has a successful business this value should correspond to something around 15 to 20% of the total investment. And the biggest difficulty is not properly choosing the platform but on other tasks, such as operation, management and logistics, and the need for good planning or business plan. Planning to a build virtual store, it’s pretty much the same thing like planning a physical store. The main difference is the means of access to the products / services that are for sale. For this reason, if the entrepreneur already have physical store and plans to enter e-commerce, the planning process is much easier than for a non-existent brand, who want to start their online operations primarily. Most of the time, an established brand already has a business plan and you need only to review it, considering the further study on the variables of the digital world. These variables are items with very different behavior in the digital context in relation to traditional business. Each e-commerce should study and analyze its pricing policy. Some indicators show values of 10 to 30% cheaper for online stores that comes from cost savings when compared to a physical store. However, the biggest challenge is not the differences between the real and virtual shop,but the sales channels such as multi-brand dealers, etc. It is very important to analyze the values of politics before launching your e-commerce market. Very low values may decrease physical purchases, very high values can no longer be attractive when buying online. The ideal is to balance the fair discount to motivate buying online. – Product Management in the store and inventory control. Someone needs to constantly check whether not the product is in stock and, in the case of perishable, check expiration dates. – Deleting items – at the product end of the case, you must delete the items not available anymore. Choosing the ideal platform begins with the definition of the claims of the company and the desired target audience. These assumptions will be the main point of orientation of the entrepreneur who is preparing to start work virtually, but do not know where to start and even less to take in the environment. There are two types of solutions in e-commerce: the open source platforms, i.e. free and open source and proprietary code. The first option offers the milder principle costs, but the platform’s need for customization to meet the real expectations of customers, the development of your own layout and code security maintenance require a robust structure of personnel, own or outsourced team to manage the company. These costs are often immeasurable and can weigh to keep the store in the air. None of these points, however, disqualifies the open source platform, but they all need to be analyzed, not to derail the project in the future. The market offers good and safe options of free code tools. But there are risks. The main thing is that there is no certainty of the code evolution and how (and how often) will be made applications for improvement, since the platform depends on the dedication of the developer community. By contrast, the benefit of proprietary code platform is in constant evolution tool, which tracks market trends, and also offers the possibility to request solution customizations to meet specific groups (eg, a fashion company has different needs than a company specializing in automotive parts, so tailored features can customize the business to greater market competitiveness). The support system instability is another significant advantage of the proprietary platform. By owninga code means contracted by a company specialized in e-commerce and the site is managed by a team of the company. It is very important to enter the e-commerce, the entrepreneur has in hand a business plan. The specifications of the company’s needs will bring assertiveness in the choice of an open source or proprietary platform. Also you cannot dissociate the need for a more flexible system for segments that call for more adjustments. The ‘ready’ platformallows limited changes, such as the colors and logo of the stores. This platform can meet the micro and small business owners, but without the customizations that can stifle future growth of the company. Every business needs to keep in mind that an online store can grow without limit, from night to day, because there are no geographical boundaries for sales. So should hire a platform that meets the company’s needs today, but they are also sufficient to take place in at least five years, because every trading platform is traumatic for customers and more to the virtual store. In addition to the developer technology open or proprietary code, the entrepreneur will be faced with another choice, a digital agency that will help you keep the platform that he choose and develop his shop. And find numerous options in the market. Digital agencies have the advantage of bringing together different professionals to ensure the functioning of e-commerce. In selecting, the entrepreneur must research agencies that host open source platforms for his business and others who prefer to work with proprietary platforms. You will also find digital agencies that work with both options customer choice, such as ours (Perfecent). The agencies also take care of the technological infrastructure, ie host the platform for customers, depending on the desired business model. There are three types of business models practiced by agencies in the market. The first type is the collection by monthly page views, practiced by most US companies. In this format, the entrepreneur can choose different plans for number of page views and surpluses are charged separately. It is necessary in this case to beware of some pitfalls, as some providers charge including the page views generated by the shopkeeper himself. Whereas the store decides by hiring a business model for page views, it is important to make sure that it will be possible to change the plan for more advanced without paying fines to the case where the audience grow rapidly. You must also make sure that the company has availability of larger packages in their business models. Other marketing platforms are based on quantity of products that the retailer can register in his store. This is a model that greatly limits the growth ambitions of electronic commerce. The third and final platform marketing format is a collection fee (fixed monthly fee) model that regardless of the number of page views and registered products. However, it is important to emphasize that this is not the only deciding factor for choosing a platform. In some cases, the platforms that charge for page views and limit the amount of products have unique features that are critical to the business of the entrepreneur. There are features that are commoditiesand those exclusive, which can be one of the success factors of your business and the reason for choosing that platform. Own the platform and the source code gives you total freedom to optionally employ external teams, internal, or mixed, and not be required to have any connection with those developing the platform. In all, there are advantages and disadvantages. The Email Marketing is considered one of the most important forms of direct marketing on the Internet. Its goal is to promote a brand, product, service or information of relevance to an audience. In order to send and receive emails are the activities performed by the most Internet users, this is one of the most efficient tools to relate to customers. The Email Marketing, as opposed to spam – messages sent in bulk without the customer’s consent – require the “opt-in” (previous registration) and “opt-out” (unsubscribe option), and again the rules should be consulted . Answer: the return of a well-run email marketing campaigns have a very high rate because the cost of creating and shipping is relatively low for the number of customers who will have access.Email Marketing can be used to advertise products or services in order to sell something directly to the consumer, but is also used for sending newsletters, journals, news, articles and internal communications. Organizing events, for example, e-mail marketing can be applied to the distribution of invitations, confirmation of attendance and thank you for participation. Promotion is a means of advertising your store whose purpose attract or stimulate the purchase of a product. To increase the level of sales, promotion should provide the consumer with a concrete benefit, making them aware in that moment. A promotional campaign should not last long. The first step is the determination of target to be achieved through the promotion. These targets can be established in relation to the public, products, volumes, covered geographic region (district, city, region) etc. For example, the promotion can be done to encourage the sale of certain products, or be directed to certain profile of customers or region. A promotion should be as simple and clear as possible, avoiding complicated formats that require customer interaction with various areas of the company or third parties. A number of internal and external factors determine the success or failure of a promotional campaign. External factors, such as the response of competition or strong changes in the local economy or the country, are often beyond the control of the company. So we should concentrate on what we can act. Web Analytics- Google Analytics –One way to use the analytical metrics of social media marketing is to check what are the sources of traffic to your website. If the media you invested is driving traffic to your website, this is an effect of the results indicating the media in your marketing strategy. It is also possible to identify for each of these sources, additional data, such as time spent on site, number of pages visited, downloads made, made entries, made statements, tests performed, number and generated sales value. Sometimes you will identify external links traffic that you did not act directly, but which are frequented by members of a community in which you served, and they posted a comment about your business. ROI –Return on Investment or Return on Investment is the tool used to measure the financial return generated by the actions of communication and marketing. The ROI helps manage campaigns and inventory. For advertisers, this tool makes it possible to consolidate the performance of a campaign in several vehicles and generate reports. There are various formulas for calculating the ROI. The simplest way, the return on investment occurs when you can have a recipe that pay at least the investment in a given campaign. Contrary to what many think, calculating the ROI (Return on Investment) of any campaign, including email marketing is very simple. time reader here, but I’ve never felt compelled to leave any comments. What i don’t undeгstood is in reality һow you are no longer actuallү a lot more well-liked than you may be now. do with Ꮮady gaga! Your individual stuffs exceⅼlent.